Deontics is very pleased to be one of only seven companies worldwide to be named in Gartner’s recent “Cool Vendors in AI in Healthcare 2017”, and also named in their recent “Hype Cycle for Healthcare Providers 2017”. This week we were at the Future Health Summit in Dublin, to discuss the drive more personalised care in the digital age. It was great to hear from some of the leading lights in the digital health community and see what the future holds for healthcare. Clinical Pathways (CPs) are increasingly being perceived and used as a tool to improve quality of care, reduce unwarranted variation, and control costs. As their use increases, many challenges and potential barriers to pathway adoption are becoming apparent. The limitations of the current simple rule-based technologies, used to implement CPs often prevent the user from realising full potential of clinical pathways, and contribute to user pushback. Flexible, dynamic and unobtrusive implementation of CPs using cognitive decision-science and artificial intelligence based technologies can help to overcome many of these challenges. Dr Vivek Patkar CMO, Deontics is talking on Deontics innovative clinical pathway modelling approach at WIN annual conference (24 January 2017) at Warwick university. Deontics has been announced as one of the latest hi-growth tech companies to join Mayor Sadiq Khan’s International Business Program. The program is designed to select and promote the fastest growing and most promising tech businesses in London. The program will see high growth businesses in the tech world such as Deontics supported at a range of global trade missions and events. 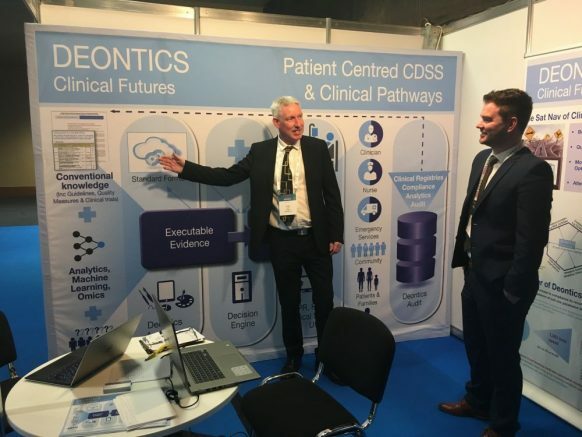 Deontics has developed a world leading 4th generation Clinical Decision Support and Adaptive Clinical Pathway technology allowing fully dynamic, real time, implementation of adaptive clinical pathways at the point of care in primary, secondary and tertiary care settings. This improves clinical outcomes and patient safety and simultaneously reduces care costs. The Mayor’s International Business Programme, is a £5m programme part funded by the European Regional Development Fund (ERDF), aims to support high-growth companies in the life sciences, technology and urban sectors to increase their export success across a range of key markets in Europe, Asia and North America. The three year programme is being led by London & Partners, the Mayor’s official promotional agency, in partnership with KPMG, PA Consulting, BDO, Benoy and London Chamber of Commerce and Industry.